For many years Professor Dr. Jozo Acksteiner has been working as a consultant and as a manager for market leading in companies such as DHL, TNT, Hewlett-Packard and Booz Allen Hamilton in Europe as well as in Asia. He has also been Adjunct Professor at the National University of Singapore. 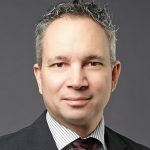 Since 2017, he is a full professor at Hochschule Fulda – University of Applied Sciences. His research interests include Logistics, Supply Chain Management, Business Analytics and Geographic Analytics.